Rory Gallagher was only 47 when he died on 14th June, 1995. The article (below – well worth a read) was written by Donall Corvin RIP, the photos are not credited but most likely to be by Roy Esmonde or possibly Mark Nolan. All scanned from New Spotlight magazine, May 1971. 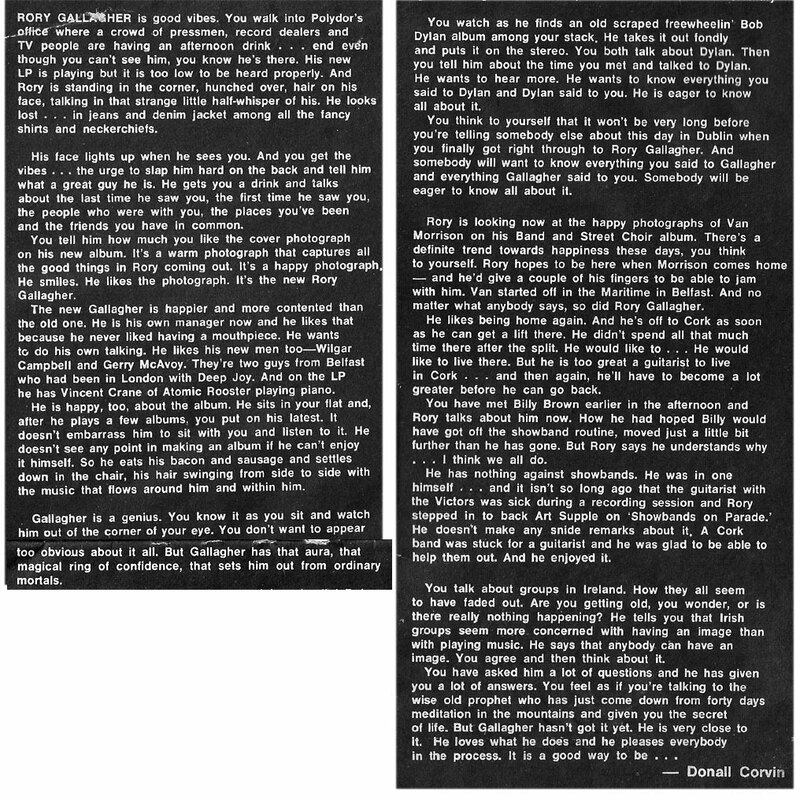 Below, also from New Spotlight, is a Q&A with Rory one year later in June, 1972. Pretty neat,I very much enjoyed reading these articles,they provided some insight into his psyche and motivation. It is just so sad his”genius” is no longer with us. R.I.P. Rory . My brother did a school mag around 1970 with a ‘Free poster of Rory Gallagher’ inside (poster was drawn by his made Reido – who did a great job). I saw a couple of his National Stadium gigs (each Christmas) in the mid 70’s and the man could walk on water. I met him in a pub in Fulham around 1986 and he was a gentleman. We play ‘Going to my Home Town” in my mongrel folk band these days and I dedicate it to Rory. Who else? I’m a life long Scottish fan, seeing Rory in Aberdeen and Edinburgh. What could I say except echo superlatives. We do Rory acoustic number whenever we play! Just come across this amazing piece of archive. Surreal!!!!!!!!!!!!! and to think that Donal Corvin is no longer with us either. I’m a Tipperary dude, who first heard of Taste on vinyl in about 1970 (thanks to my pal Noel Hayes) but the milestone of my life was/is/remains May 1972 – Rory Gallagher – Live (in Europe) at the National Stadium, South Circular Road, Dublin. Support from Cork’s Sleepy Hollow (I think) but when Rory and his band of brothers came on stage, words fail to describe the gut emotions and the sheer beauty of the music as Rory drove his band to higher levels before cooling it all off with ‘When I was a cowboy – out on the Western Plains’ – we were eating out of his hand before the night was out.